What Did You Do With Your Kizashi Today? Re: What Did You Do With Your Kizashi Today? Did my first Ice Rally today. Wasn't very competitive though because after the first run I couldn't find grip anywhere. It was a lot of fun and I managed not to break anything, so I guess I can't be too upset about it. BLyons wrote: Did my first Ice Rally today. Wasn't very competitive though because after the first run I couldn't find grip anywhere. It was a lot of fun and I managed not to break anything, so I guess I can't be too upset about it. NICE! Where at and what tires are you using? On a lake in Wisconsin. I have Michelin X-Ice tires, though this is their 4th winter so that probably contributed to the grip issues that the WRX's didn't seem to be having. Just out of curiosity, did you have any drivetrain issues or service engine warnings while you were rallying? I pushed Kitsune too hard out in a frozen parking lot recently during a couple of sliding burnouts, and she threw the "Hill Hold Disabled" and "Service ESP" warnings on me. I parked Kitsune for a couple minutes, turned her off and back on, and the warnings went away. I'm pretty sure that I overheated the CVT, but am not entirely sure. I was wondering if you had any issues out there on the track. Nope, I didn't have either of those pop up. Yeah, there ya go...mandatory back-up cameras...all about the safety ya know...coulda been a kid back there, gov mandated fail! As a CX5 owner w/ the mandatory useless thing on the dash, when I do look at it, the thing is always covered in road grime anyway, so the picture is pretty much useless. I need a gremlin back there spit shinning the thing constantly for it to be of any use around here. I wipe it off with spit anytime I'm back there and remember, but it's always a mess. Unless it never rains or snows that is I still use the tried-n-true head-on-a-swivel and scan the mirrors method. Much better picture of what's going on. Never backed in to anything (or anyone), ever, in my life. Head up, eyes open works just fine. My camera (eyes) and my processor (brain) are still functioning at a better level than the over-priced useless crap in the car. KISS. I was reminded, yet again this past week, of the absurdity of the mid-level 2018 techno-laden CX5's heated mirror deficiency. I have a rear defroster, heated seats (I don't need or use), and live in the Norhteast U.S. where, amazingly, we did get freezing rain this week, but alas, no ability to see back-range to merge. I was notified immediately leaving the house the forward radar was disabled (blocked) due to the car being completely covered in a skin of ice. The kind of ice that doesn't scrape off w/o damaging whatever you're attempting to get it off of. It has to melt off by natural or electrical methods. Unfortunately it had not released its grip at all hallway through my journey where I have to merge onto a very busy fast moving highway. So, should I have trusted that the side radar sensors for the merging BS are working since the entire car was covered in ice and the forward radar indicated DOA? Lack of exception handling on the 'other' automation system that someone deemed unworthy of a fault condition...trust it? I think not. The side mirror's warning light wasn't on even though my processor (brain) tells me it KNOWS there's vehicles there in the blind spot approaching. But I can't see where exactly nor gauge how fast. This is precisely how MORE accidents will occur, mindlessly trusting the tech is always going to work, uh not. So, I had to resort (digress) the methods used when driving my 1960s Chevys...put the window down (it wasn't happy about that btw), stick head out enough to look back and gauge traffic velocity before merging at speed. That's always enjoyable when it's below freeing out, in the dark, accelerating to match traffic speed. This is a techno-packed 2018 mid-level model car....this is also known as progress. Maybe when your car can communicate (talk wirelessly directly or via the cloud) with her car, they can enter into a Mexican stand-off whilst backing out of parking spaces at the same time (weather permitting of course) However, then of course, we'll need the mandatory A.I. (and not Allen Iverson) to take-over from there aye (again, weather permitting)? Sorry to see your car all beotch'd up like that. That's not going to be cheap to repair. Tail light as well as the bumper cover. I suppose, technically, you don't have to do a thing about it. 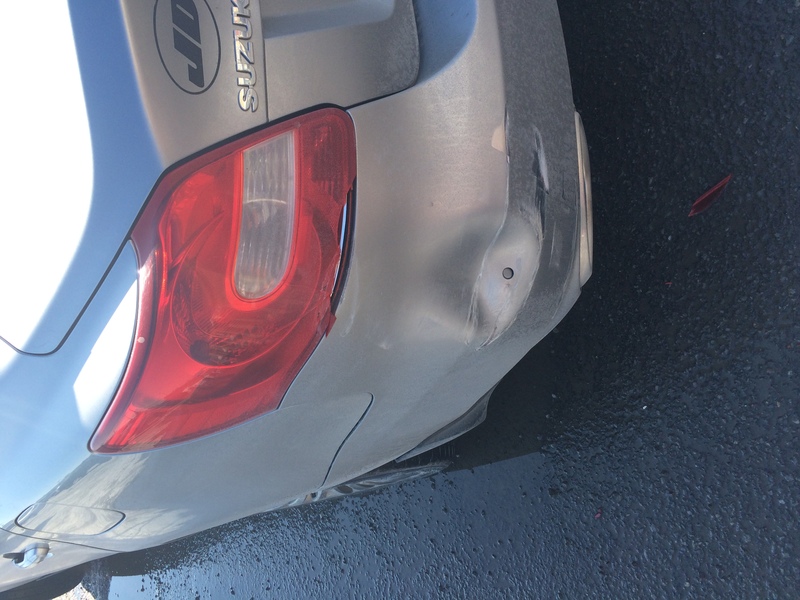 What did I do today with my Kizashi? Popped the hood and put it back on the battery tender. 1/2 after your deductible. Doesn't seem worth getting them involved only to ding your incident involvement number (aka renewal premium). If you're going to fix it, I'd do it outside the insurance as you're thinking....unless you have actual, and complete, accident forgiveness or some other such non-sense. Nothing is free when it comes to insurance.